Ever have questions when pairing food and wine? With WineStein Pro, a “genius” application for your iPhone, you can select the perfect wine for every meal. It’s like having a sommelier in your pocket, on call to offer advice. Simply enter your meal’s main ingredients, sauces and sides, and WineStein is ready to help! Using cutting-edge artificial intelligence, the app creates a “meal DNA” used to determine the best wine pairings. A scored list of wines, each with a full description, is produced for every dish you enter, and you can refine the results by choosing appropriate filters that range from color to price. WineStein Pro is available for iPhone, iPod touch, and iPad. It requires an internet connection, and an iOS of 4.2 or later. And did we mention that the app is currently free? It’s travel time! Remember Jake Austad’s trek through California’s wine country? Here’s a handy, travel app specifically made so that you can enjoy such an adventure: Winery Quest Pro. Designed for the iPhone, iPad, and iPod Touch, this informative winery reference tool gives you everything you need to plan your California wine trip. With 20 regional maps, filters for your favorite wine interests, detailed winery profiles, and a GPS navigated trip log, you’ve got everything necessary to embark on your own journey through California’s wine country. With Winery Quest Pro, planning your trip is easy! And with the freshest wine and winery data updated daily, you’ll be kept in the loop with current information. Winery Quest Pro requires an iOS of 3.0 or later. Available from iTunes with rave reviews, its current price is $7.99. Have a favorite wine app? Tell us about it in the comments and maybe we will review it! Happy Labor Day! Hope you’re all enjoying your day off. We’ll be sipping some wine and enjoying the remaining summer sun. Right now, though, we’re reviewing an app that will let you keep a few notes on the bottle you’re enjoying without taking up a lot of time. If you want a quick, simple way to remember a good wine on the go, Vivino, a free app, is for you! Simply use your smartphone to take a picture of your wine, and give it a “thumbs up” or “thumbs down” for future reference. 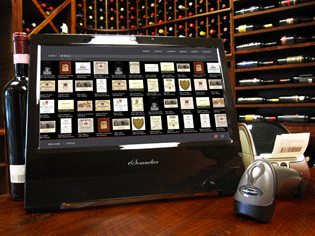 You can go into greater detail, too, and rate and review your wine, if desired. You can even share your wine experiences on Facebook and Twitter. With a growing database of 400,000 wines, the application utilizes the latest image mapping technology to auto-match the picture of your wine bottle, instantly providing you with the wine’s facts, ratings, pairings, and more! These at-a-glance “stats” will even help you make better informed decisions at your favorite wine store. While not a massive, all-in-one app, this easy-to-use wine tool is extremely convenient. (When viewing a wine’s statistics, the app is almost like a digital “baseball card” of the wine.) Plus, it’s free. Vivino is compatible with the iPhone, iPod touch, and iPad. (It requires iOS 3.2 or later.) It’s also available for Android, BlackBerry, and Windows 7. Check it out! If you’ve ever had a really good wine, but later on forgot what it was, Corkbin is for you! With Corkbin, simply take a picture of a wine you want to remember, jot down a note about it, and (if desired) share it with your friends! Copies of your wine images and notes remain in your mobile device, so you’ll be creating an ever growing visual record of all the wines you’ve tried. The latest Corkbin versions boast improved graphics (with support for the Retina display), improved usability and consistency of the user interface, new privacy features, stability, and more. At the time of this blog, the current version is 2.0.2. For 99 cents, Corkbin v.2.0.2 is available in both Apple’s App Store and the Android Market. Cheers to that!